The event has started at the Inner Harbour. Performace starts this evening at 7:30pm. After 3pm chairs can be placed on the upper and lower causeways. 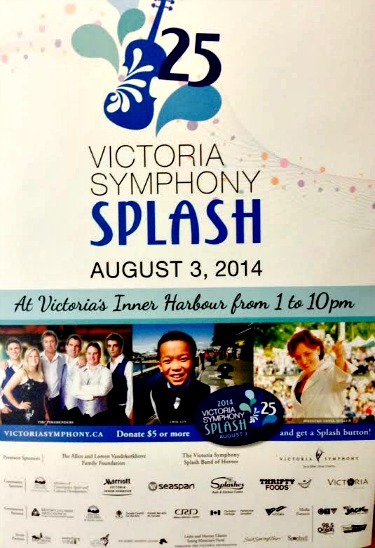 A Twenty Five year celebration for The Splash and is now the largest annual symphony event in North America! Each year a young soloist is chosen to perform with the Victoria Symphony a tradition starting in 1994. Erik Lin is nine years old. He started piano lessons at age five. May 2013, he was invited to perform at the opening of the David Foster Foundation Theatre at the Oak Bay Beach Hotel. Along with many prior performances, awards and honours. I'm sure Eriks music teacher, Ingrid L. Henderson will be smiling from ear to ear tonight along with his family and 40,000. other people... smile. If you can please donate $5.00 for a button supporting the event. Have Fun, Be Safe... please stay tuned for more updates. 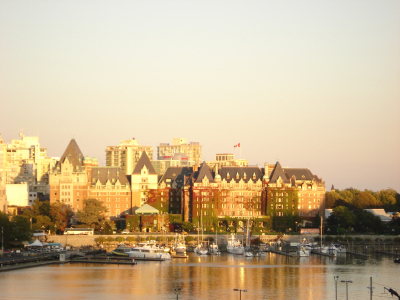 Below is a photo of the Victoria Inner Harbour showing off the Empress Hotel and Causeway.